When Jyggalag was cursed to take on the form of Sheogorath, he had the Great Library burned. The Madgod could not bring himself to destroy the knowledge which Dyus possessed, so instead he imprisoned him in the ruins of the Great Library, forbidding him to die. These ruins were slowly encroached upon by the Root, and became known as Knifepoint Hollow. At the end of each Greymarch, Sheogorath would cast out every element of Order in the Isles except for Dyus. 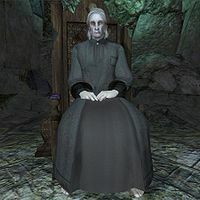 In 3E 433, after a failed effort by Sheogorath to halt the Greymarch, Haskill sent the Champion of Cyrodiil to speak to Dyus, in the hope that he would know how the Champion could wear the mantle of Madness. Dyus aided the Champion in creating the shell of a new Staff of Sheogorath, although all of his logical calculations predicted that the attempt would fail. The Champion later freed Jyggalag of his curse, taking on the title of Madgod and defying Dyus' predictions. For game-specific information, see his Shivering Isles article. ^ a b c d Dyus' dialogue in the Shivering Isles. Esta página foi modificada pela última vez à(s) 19h22min de 26 de abril de 2015.